Remember, the ordinary change management methods won’t do a very good job at that. 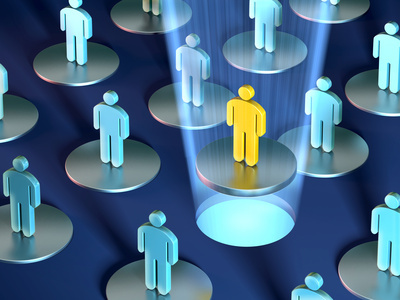 You managers may overlook the isolated successes which take place under their noses. Or even if they have spotted them, they may repackage the discoveries as templates of success and disseminate them from the top. This seldom generates the enthusiasm necessary to create change. The key is--to engage the members of the community you want to change in the process of ‘discovery’, making them the evangelists of their own conversion experience. This means that as a leader, you will take on a very different role from the one you have played in previous change management scenarios. It is about uncovering these positive deviants— who are usually individuals on the periphery of their organizations or societies and are far removed from the orthodoxies of mainstream change endeavors. These innovators’ uncommon practices and behaviors enable them to ﬁnd better solutions to problems than others in their communities. They are the key to this approach to change. Goldman Sachs used it to transform the practices of its nationwide force of investment advisers. Engineers at Hewlett-Packard used it to tackle technical challenges. At Genentech, two positive deviants outperformed the median results of the company’s national sales force by a factor of 20:1. Merck and Novartis had experimented successfully with the model as well. How this model could be activated in your company or organization? In the positive deviance model, problem identiﬁcation, ownership, and action begin in and remain with the community. Because the innovators are members of the community who are “just like us,” disbelief and resistance are easier to overcome. By contrast, it is a design that allows a community to learn from its own hidden wisdom is, among other things, respectful. Innovator and adopter share the same DNA. Community members invest sweat equity in discovering the positive deviants, and, in the process, they become partners to change. Inside-the-box deﬁnitions of problems guarantee inside-the-box solutions. Restating the problem shifts attention to fertile new ground and opens minds to new possibilities. If there is an art form to facilitating a positive deviance inquiry, it lies in ferreting out and framing the real challenge at hand, as opposed to reverting to tired clichés and pseudochallenges. By casting a problem in a different light and by using hard data to confront orthodoxies, a community can be encouraged to discover whether there are exceptions to the status quo and, if so, how those exceptions came about. Reframing a problem entails three steps. First, grasp its conventional presentation (“The sorcerer’s curse makes our children sick”). Second, ﬁnd out if there are exceptions to the norm, people in identical circumstances who seem to be coping especially well. Third, re-frame the problem to focus attention on the exceptions. And remember, there’s value in looking at things in a different way and getting beyond gut feelings to hard facts. These ‘positive deviants’ may fear being exposed, ridiculed, or subjected to retaliation if their newly enhanced inﬂuence challenges the status of others. Authority ﬁgures may feel threatened by a process that invites them to learn rather than just have all the answers or, that dis-empowers them altogether. Likewise, the others in the group may fear that acknowledging a problem implicates them in it. Only when people feel safe enough to discuss a taboo and when the community has been sufﬁciently invested in for ﬁnding solutions, can the prospect of an alternative reality appear. Corporations have their own sets of unspoken taboos that, if not addressed, can develop into problems of Enronesque proportions. Thus it is imperative to kicks off ‘positive deviants’ by emphasizing the importance of confronting problems squarely and of learning from past failures. The focus is on identifying and removing obstacles, not killing messengers. Candor is crucial to this work. Corporations are awash in meaningless discourse. While words are exchanged and heads are nodded, a great deal of signal distortion is happening between sender and receiver. Because of unwritten social codes meant to keep individuals from being put on the spot, people aren’t forced to speak concretely—in fact, they’re often discouraged from doing so. These abstractions do a lot to obscure insight. Consider, for example, how the format of Power-Point can blur or hide hard facts: Before NASA’s devastating loss of the Columbia space shuttle, engineers from Martin Marietta and Boeing buried the imminent risks to the spacecraft’s protective ceramic tiles within the complicated, nested, ten-point-font bullet points of their PowerPoint presentation. A ﬁrm grasp over reality removes vague assumptions and helps focus attention on what’s really working. It asks you to deal directly with an uncomfortable truth. It requires you to state it concretely so that there is no way to duck the challenge at hand. This is not merely a matter of being speciﬁc. It also entails portraying or dramatizing a pivotal issue in a compelling way. The old adage “Seeing is believing” has particular potency when it comes to change. And ‘social proof’ is the lifeblood of the support group movement. The substantiated proof of how other are achieving exceptions in their own community is the key here. Leverage it. You must create a movement around it. Newton was right: Every action has an equal and opposite reaction. In organizations, that reaction comes in the form of avoidance, resistance, and exceptionalism. But when you fan the embers within a community rather than rely on ﬁrebrands from headquarters or outside the group (experts), the change would feel very natural. Internally developed solutions always circumvent transplant rejection, since the change agents share the same DNA as the host. The trick is to introduce already existing ideas into the mainstream without excessive use of authority. Why use a sledgehammer when a feather will do? You’ve a new role as a leader! The positive deviance approach requires a role reversal in which experts become learners, teachers become students, and leaders become followers. Leaders must relinquish to the community the job of chief discoverer. This isn’t easy, for it requires you to set aside your egos and habitual identities (being the go-to guy, the decision maker who knows what to do). What, then, becomes of you--the leader? While you seemingly abdicate the traditional role of discoverer, important work remains to be done. You still have four primary tasks: management of attention, allocation of scarce resources, reinforcement to sustain the momentum of inquiry, and application of score-keeping mechanisms to sustain attention and ensure progress toward goals once the community has chosen its course of action. Instead of being the “CEO”—chief expert ofﬁcer—you become the “CFO”—chief facilitation ofﬁcer—your job is to guide the positive deviance process as it unfolds. This role is as radically different from traditional leadership practices as the technique itself is from standard approaches. The method works best when behavioral and attitudinal changes are called for—that is, when there is no apparent off-the-shelf remedy and successful coping strategies remain isolated and concealed. In such cases, change from within, discovered, celebrated, and implemented by the people who need to do the changing, is a sure shot win. Traditional change efforts are typically top-down, outside in, and deﬁcit based. They focus on ﬁxing what’s wrong or not working. They also assume a reasonable degree of predictability and control during the change initiative. Unintended consequences are rarely anticipated. Once a solution is chosen, the change program is communicated and rolled out through the ranks. 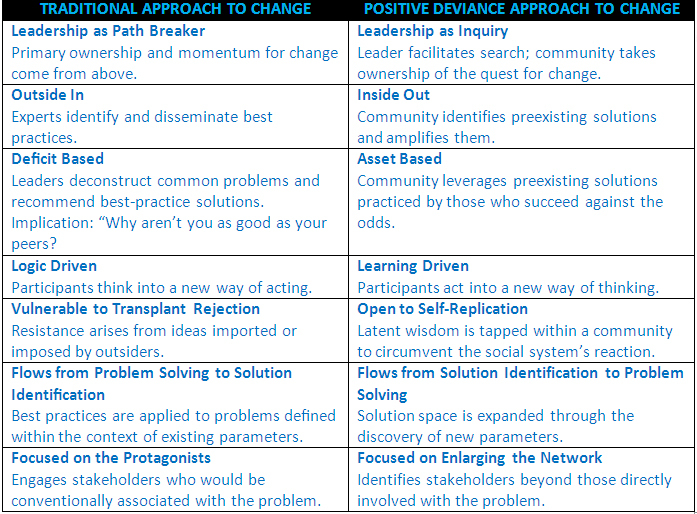 The positive deviance approach to change, by contrast, is bottom-up, inside out, and asset based. It powers change from within by identifying and leveraging innovators. This method diminishes the social distance that often blocks acceptance. "Learn from the people, plan with the people, begin with what they have, build on what they know; of the best leaders when the task is accomplished, the people all remark--we have done it ourselves."